Den peeler, renser og fugter huden, efterlader den blød og glat. 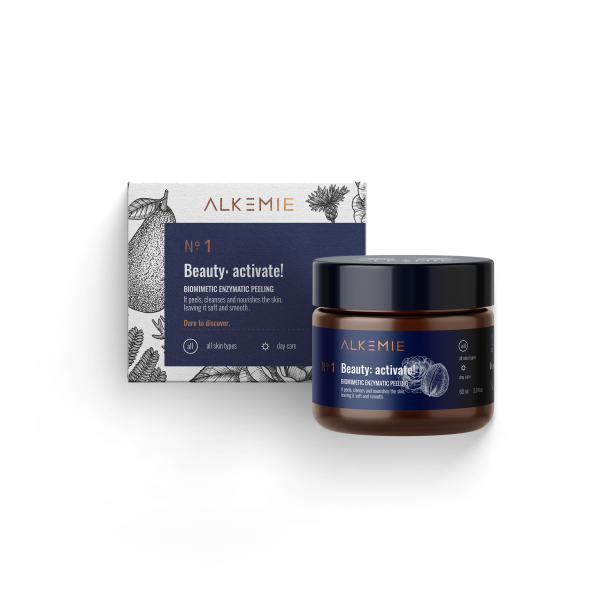 Den hemmelige opskrift: peelmoist, fruit pulp extracts, ectoine, kahai, tsubaki and macadamia oil, vit. E, organic glycerin. Skønhedsritualet: anvend et tyndt lag af peeling på den rensede hud, massér blidt og efterlad cremen i 5-10 min. Skyld dit ansigt i varmt vand. Ingredienser:Aqua, Glycerin, Coco-Caprylate/Caprate, Decyl Cocoate, Cetearyl Alcohol, Isoamyl Cocoate, Camellia Japonica Seed Oil, Macadamia Ternifolia (Macadamia) Seed Oil, Cetearyl Alcohol, Glyceryl Stearate, Stearic Acid, Myristyl Myristate, Rhus Verniciflua Peel Cera, Spondias Mombin Pulp Extract, Caryodendron Orinocense Seed Oil, Mangifera Indica (Mango) Pulp Extract, Musa Sapientum (Banana) Pulp Extract, Papain, Calcium Pantothenate, Ectoin, Xanthan Gum, Urea, Magnesium Lactate, Benzyl Alcohol, Potassium Lactate, Heliantus Annuus (Sunflower) Seed Oil, Serine, Alanine, Sodium Phytate, Proline, Magnesium Chloride, Tocopherol, Sodium Citrate, Dehydroacetic Acid, Caprylyl Glycol, Ethylhexylglycerin, Parfum, Benzyl Salicylate, Coumarin, Linalol, Limonene, Alpha-Isomethyl Ionone.